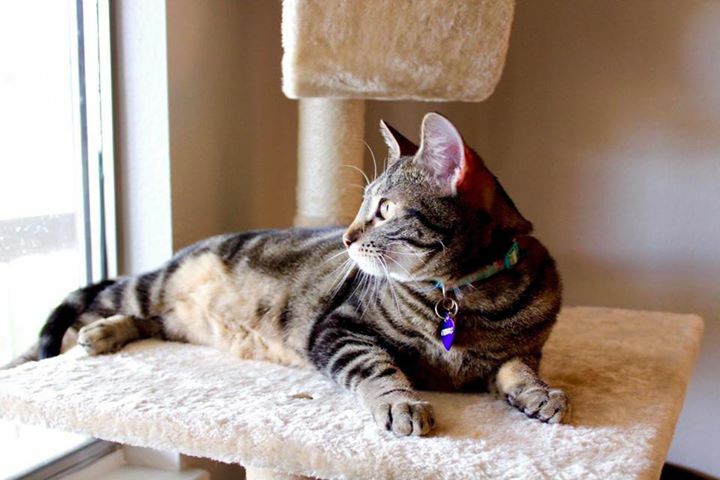 Posted: October 29, 2016 Category: Vet Blog Post! Why, Nikki – what pretty eyes you have! 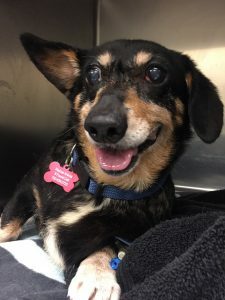 In our first installment on Nikki, the gorgeous 8 year old dachshund from Denver Dachshund Rescue and Transport, we talked about her bladder stones. Now it’s time to talk about that cherry eye of hers! In our final part, we will talk about her fractured tooth, so stay tuned! Cherry eye – what does that even mean? This is a close-up of Nikki’s cherry eye before her surgery to replace the gland to a more normal position. What is the problem with having a cherry eye? In most cases, having this extra tissue rubbing against the eye is irritating, and can cause not only discomfort but also occasionally scarring of the sensitive front portion of the eye, the cornea. Scars on the cornea work a little bit like bird poo on the windshield. They don’t keep you from seeing out, but they can obstruct some of the vision. In addition to scarring, this tissue sticking up abnormally into the field of view can also obscure vision. 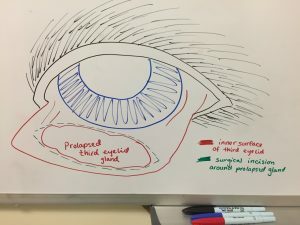 Finally, this gland, when it is swollen and displaced from its normal location within the third eyelid, can have not only decreased function but the presence of the gland in an abnormal location can block normal tear flow over the eye and out of the tear duct, causing inappropriate eye discharge. This is not an uncommon condition and Parkside Animal Health Center handles it with some frequency. 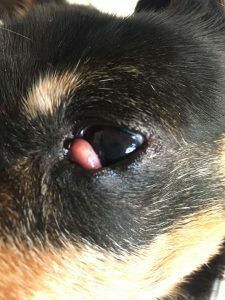 What can be done about the cherry eye? Unfortunately, this is a surgical problem. We don’t want to remove this prolapsed gland, since its tear-making function is so important to the health of the eye. Therefore, we need to make a pocket into the backside of the third eyelid and “tuck it back in”. While this is generally a very quick and effective fix, there is always a chance this condition can recur in the same or other eye and require additional surgery in the future. Dr. Eisenhauer drew the pictures above to illustrate a couple of things. In the first drawing, we see an eye, with the third eyelid pulled out so that the back side (inner surface) of it is visible. It is from this side of the eyelid that the third eyelid gland prolapses. 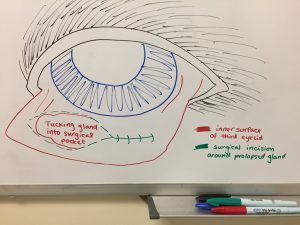 During surgery, where the green dotted line outlines the prolapsed gland in the first drawing, we make a partial-thickness incision into the eyelid around the gland. The second drawing illustrates how we can then “sew a pocket” over top of the prolapsed gland, which replaces and holds it into a more anatomically normal position. 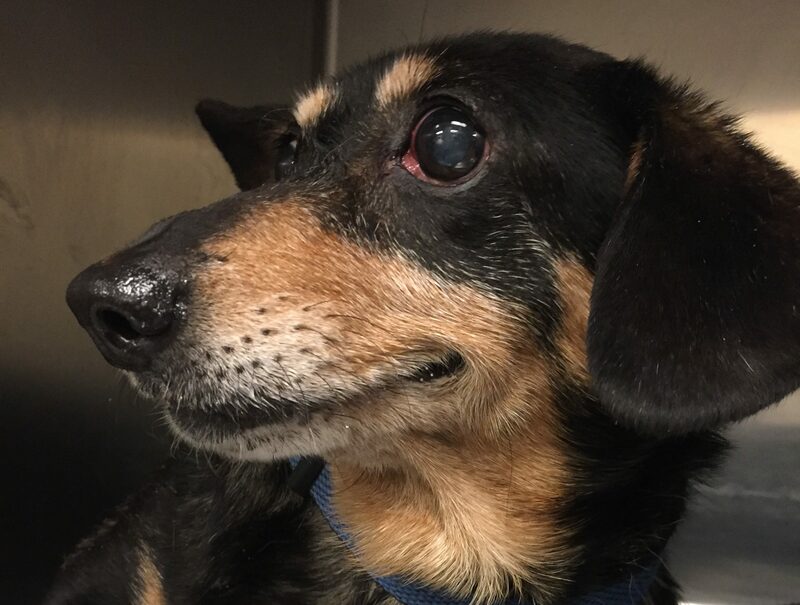 After the gland was replaced in Nikki, her third eyelid had some inflammation associated with the surgery. However, this generally resolves in 3-5 days and cosmetically she should be good as new by that time! However, complete healing will take 10-14 days and some swelling can be normal throughout this period of time. In this photo of Nikki’s third eyelid immediately after surgery, you can see two suture knots on the outside of the eyelid. The suture we use is absorbable, so the stitches will not need to be removed. Even though our incision is on the inner surface of the eyelid, we have to be careful to keep the knots at either end of the incision on the outer surface of the eyelid. This prevents the knots from rubbing against the eye, causing irritation to that sensitive cornea. Why does the prolapse happen, and we can prevent it? Unfortunately, some dogs are prone to development of this condition, and others will never develop it. 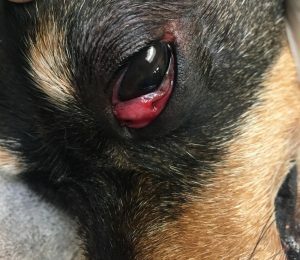 Sometimes the cartilage within the eyelid is shaped inappropriately, which can contribute to the cherry eye development. The cartilage in the eyelid is shaped like a “T”, and if any part of this “T” is too long or too short, the eyelid can lay in an abnormal way, predisposing the gland to prolapse. Certain breeds are also more prone to this condition than others (cocker spaniels, beagles, bloodhounds, boston terriers, shar peis, English and French bulldogs, great Danes, Lhasa apsos, Neapolitan mastiffs, Newfoundlands, Pekingese and shih tzus). There may be a genetic component as well as structural predispositions (as with our “droopy-eyed” and “bulgy-eyed” breeds). How is Nikki doing after surgery? Nikki has to wear an e-collar (cone collar) until the surgery site heals. While she feels better having the gland replaced into a more normal position, we know that a healing surgery site can feel irritating or itching. The cone is not only to prevent Nikki from hurting the surgery site, but also to prevent her from accidentally scratching her cornea and creating an ulcer if she goes to rub her face with her paw, or against the floor or a piece of furniture. Depending upon the damage done to the cornea by the prolapsed gland, some dogs also require a topical eye medication to help the cornea heal and help preserve vision in the irritated area. This is Nikki after she woke up from her surgery, already looking more comfortable!